Anglers are evolutionary creatures. When they first start fishing they just want to go fishing and catch some fish, generally any fish, but they want to catch some fish. If they persist at fishing they usually evolve to the next level; catching lots of fish. Then they generally move to wanting to catch big fish or even trophy fish. Somewhere along this evolutionary line they may become fly fishers, tournament anglers, or, horror of horrors, angling writers. Some people never evolve beyond wanting to catch a limit or getting just one more trophy for the wall, but many anglers find themselves seeking ways to put more challenge in their angling experience, and they begin to invent ways to make angling more exciting. Years ago JC and I would play a game we called trout golf. It was a game that we played against ourselves, and the score was just a fun way to add a greater challenge to our times on the stream. 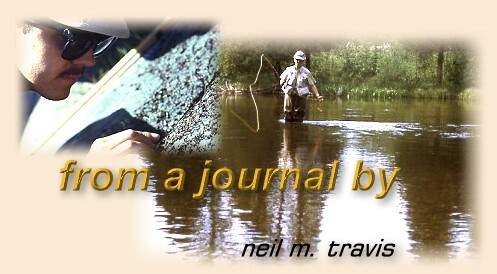 Since most of our fishing in those days was dry fly fishing the rules of the game was basically quite simple. You counted each fish that rose to your fly, the number of fish that you missed when they rose, the number of fish hooked but lost, and finally the number of fish hooked and landed. Foul hooked fish did not count as fish hooked and landed. It wasn't serious, we never competed against each other, and it was all based on memory. It was just a fun activity. In recent years I have changed the rules a bit by adding some handicaps. I fish a high mountain lake that has a good population of brown and rainbow trout. The lake has some excellent hatches during the summer season and I have limited myself to only fishing dry flies to visible trout. Some days I only cast to trout that I have seen rise to take a fly off the surface. Since the lake has a generous population of trout in various sizes on some days I decide that once I catch a 20 inch fish or an 18 inch fish I will quit fishing. Occasionally that means I only catch one fish, and some days I never have to quit until I get tired of casting. Years ago I knew an angler that only fished with dry flies. To further add to his handicap he tied only one pattern and only two colors; light gray and dark gray. He tied them from size 8 to 28, but they were only in those two colors. His theory was that color was only a secondary consideration when choosing a pattern, and size and presentation were far more important to success. In the course of the season when trout were feeding on dry flies he was generally just as successful as all the other anglers, and in many cases he out fished the angler with a box full of more exacting patterns. Today many states have specific regulations that specify that you must use barbless hooks, but JC and I were advocates of barbless hooks way back in the 60's. Many people thought that was a handicap, but we always believed that a barbless hook penetrated easier than a barbed hook, and was much easier to remove from the fish or from your own ear, if that became a necessity. I still fish with barbless hooks, but I never have considered it a handicap. I did know one guy that took the entire game one step further. He broke the barb completely off his flies so that a fish could never actually get hooked at all. He considered it a success if a fish rose and took his fly.